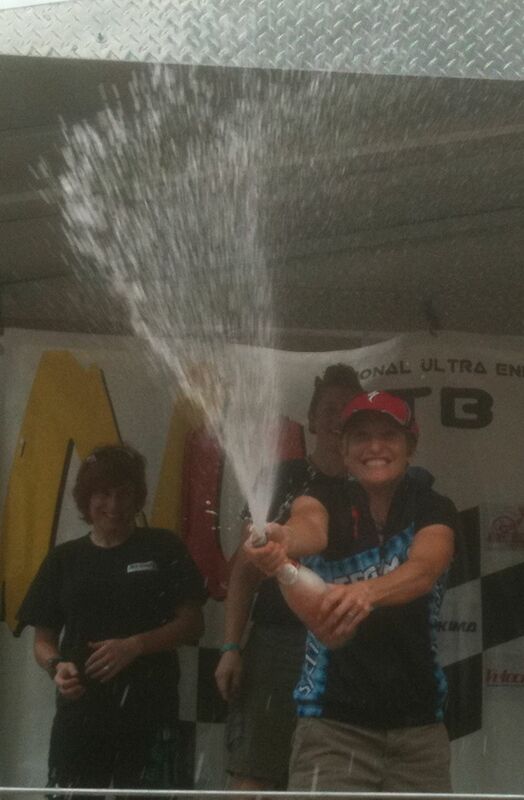 Stop number three in the National Ultra Endurance (NUE) series is the original Ohio 100 mile mountain bike race that inspired promotor Ryan O’Dell to make the 100 mile format a national level event series. This race has everything: tons of sweet single track, gravel roads, pavement, and even some gopher holes… more on that later. In the Pre-race cyclingnews.com preview, travel companions Trek rider Jeff Schalk and Team CF rider Cheryl Sornson were favored to win their respective categories. 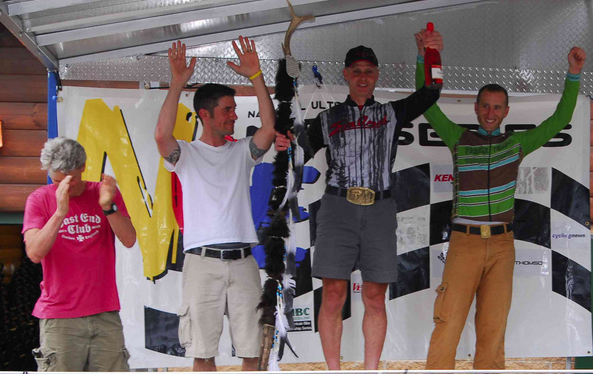 I was considered a threat to reigning Masters NUE champion and 29er Crew teammate Robert Herriman since I finished 2nd to his 3rd in the NUE opener Cohutta 100 last month. Bang! The start in downtown Loudonville is a drag race down the main street then up a 500 foot elevation gain on the hill out of town. The pace is fast, exacerbated by the fact that there’s a $200 preem to the rider first to the top. I’m not feeling so hot. My Trek Superfly Elite 29er hardtail is dialed. I’m running Bontrager 29-2 tires. Despite this, both Robert and Doug have a better start than I. I see Doug riding away up the climb out of sight towards the preem. He’s flying. My travel companion Cheryl rides by me too. After a couple of miles of red-zone riding, we dive into single track, which is what we’ll be riding for the next 30 miles or so. During a steep climb which I had ridden in the warmup the day before, everyone’s off. It’s a hike-a-bike due to traffic. I hike past Cheryl and a few others. Soon I find myself right on the wheel of Crew teammate Jason Pruitt riding single speed. On a slightly off-camber descent, Jason goes down. He responds that he’s OK and I continue on. While I was going backwards for most of the first few miles, things are settling down enough where I’m starting to pass people back. I pass a rider on the side of the trail at about mile 8. Hey, that was Doug! I would find out later that he had crashed pretty hard. 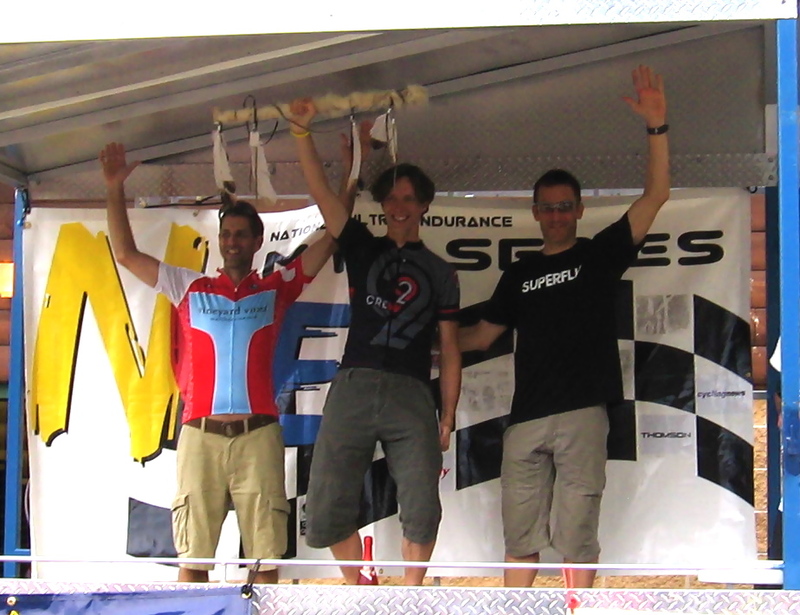 I settle in with DC MTB team rider Ian Spivack and Champion-System-Cannondale rider Andy Applegate. Andy’s riding conservatively so Ian and I ride past. Ian and I eventually are riding behind single speed rider Mike Ramponi who had to stop for a mechanical. He’s riding the single track super-fast and gaps us several times. I finally take over the lead after he over-cooks a turn. I turn up the heat a bit and get a little gap on Ian. Past aid station 1 and several miles later I hear a rider slowly closing the gap behind me. It’s Jason Pruitt. Just as Jason gains contact, we catch the Masters leader and fellow crew teammate Robert Herriman in the single track around mile 25. We three ride together chatting for a bit. I get around Robert when he dabs on a sharp uphill turn. I guess I was descending faster because I opened up a small gap before an extensive pavement section. It appears that Jason and Robert are sticking together. As appealing as it might have been to ride some more with teammates, I’m now sitting in the first place spot, so I drill it for a bit to try and make it stick. It takes awhile, but I finally see no sign of them. I pretty much ride solo through mile 72 to aid 4. So far so good… but I have burned some matches and my luck is about to change. As I’m cruising into aid 4, I’m scanning the layout of the aid station looking for where my bottles might be. It’s a grassy lawn just 30 feet before the aid 4 pavilion. Suddenly, I’m on the ground. In spectacular form, I’d ridden into a large gopher hole obscured in the grass that I didn’t even see. I’m sure it was hilarious, but I got a nice shiner on my left eye and seemed to have a right hand sprain. The folks at aid 4 were great. They got me on my way as quickly as I could, but I was pretty rattled. I was also becoming dehydrated. The next 15 miles showed a slow but steady deterioration of my form. Robert caught me right after aid 5 during a bad moment on the climb up to the final single track section at mile 90. I was moving pretty slow by then. I tried to stay in contact but I just didn’t have it. I finished just a minute behind him in just under 8 hours. Chris Irving of Red Ant Racing finished 3rd. Doug Andrews was apparently still in the mix too, but got off course late, so I think I dodged a bullet there. Congratulations to my travel companions Cheryl who won the woman and Jeff who won the open. Mike Simonson had a great ride to finish 2nd with Team CF riders Brandon Draugelis and Christian Tanguy finishing 3rd and 4th. Bach Builders rider Josh Tostado finished 5th rounding out the open. 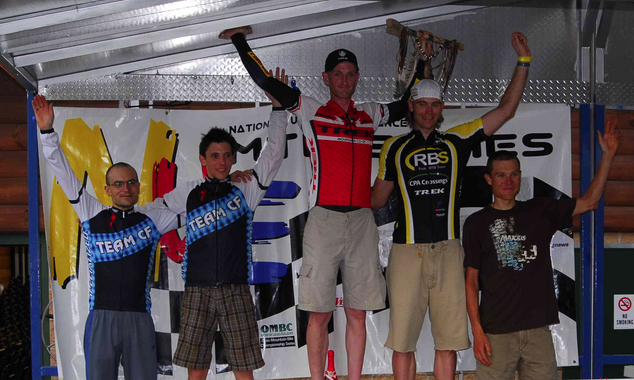 Salsa/SPK rider Gerry Pflug continued his dominance in the single speed with the win. Freeze Thaw Cycles Matt Ferrari was 2nd and teammate Jason Pruitt hung on for 3rd. Mike Ramponi finished 4th. Well done gentlemen. It’s early in the series, but after two races I’m tied for the series lead in the Masters with Robert Herriman. Next up the Lumberjack 100 in Robert’s home turf of Michigan in two weeks. This entry was posted on June 8, 2011 at 6:20 pm and is filed under Must do Races. You can follow any responses to this entry through the RSS 2.0 feed. You can leave a response, or trackback from your own site.